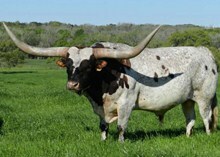 At Double N Cattle Company we breed and raise longhorn cattle in Muenster, TX. We are an award-winning Texas Longhorn breeder, and pride ourselves respecting the history and traits of this magnificent animal. We have many longhorns bulls for sire as well as a number of calves and heifers currently for sale.